If you’re a gamer, you know how frustrating it can be to find a high quality mouse. Your needs are much different than most users. Sometimes you’ll need something with an incredibly high DPI for lightening quick response. Other times, you’ll something a little less sensitive for a comfortable gaming experience. Your mouse needs to be weighted correctly and be comfortable to use. The buttons need to be reliable so they don’t wear out after a particularly vigorous gaming session. What’s a gamer to do when their old mouse just doesn’t cut it anymore? 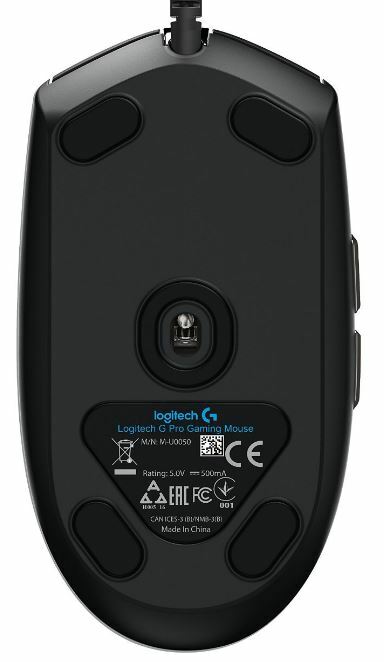 According to Logitech, you pick up a G Pro FPS mouse. This mouse promises to use the highest quality components on the inside, while featuring a striking visual design on the outside. Is this mouse all talk, or can it truly stack up to some of the tried and true mice that are favored by gamers everywhere? 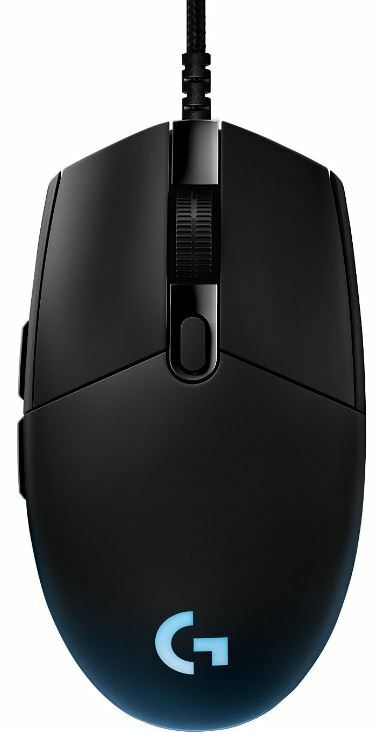 The first thing we noticed with the G Pro mouse was how similar it was to the G303 they released last year. The G303 was well reviewed and loved by gamers everywhere, so that could only be a good thing for the G Pro. On the other hand, this mouse is being promoted as an upgrade to their older model. Is this just a rehash of an older product, or did they truly add some meaningful upgrades? Here’s an in-depth look we took to find out. The shape of the mouse is very reminiscent to the bare bones mice that have been shipping with computers for years. Of course, there are some very subtle differences that really help it stand out from the vanilla mice we’re all familiar with. The grooves in the mouse have a sharp, outward slope that matches the pointier face of the mouse, giving it a more aggressive look. The scroll wheel isn’t the rounded affair we’re used to, instead it’s a straight-edged wheel with deep grooves that keep your traction high. The most striking visual feature is the LED light strip that runs along the back of the mouse. This LED can display up to 16.8 million different colors, allowing you to give your mouse a personal splash that really stands out. We’re a huge fan of the design of the G Pro Gaming mouse. It’s attractive enough to stand out, but they refused to let any design elements get in the way of its functionality. For a gaming mouse, the G Pro FPS is actually very compact. Measuring just 4.6 x 2.4 x 1.5, it’s significantly more petit than the behemoth mice we’ve become familiar with in the gaming world. This will be a huge bonus for gamers with smaller hands, as it can be hard to find a mouse that is easy to use. Even if you have larger hands, the mouse just feels right from the moment you pick it up. So many gaming mice require you to essentially adapt your entire hand to the layout that the manufacturer designed for you. But the G Pro FPS just feels comfortable, allowing you to hold it however feels natural for you. The weight really adds to this as well. It’s about 2.9 ounces. So it’s a little heavier than standard mice, but still light enough to move around easily. This gives you just enough resistance to improve your control over the motion of the mouse. Plus, you won’t find it fatiguing to use, even after a long gaming session. As far as gaming mice are concerned, The G Pro keeps things pretty simple. You’ve got a total of six buttons, five of which are used for input during gaming. Of course, you’ve got the left and right mouse buttons. On the left are the two thumb buttons. Finally, you have the clickable scroll wheel. Until you’ve used it, it’s hard to describe just how amazing these buttons feel. Imagine upgrading from a rubber dome keyboard up to a mechanical keyboard, the G Pro is the mouse equivalent. The buttons feel resistant, and yet totally precise. You’re able to determine when you press the buttons with an almost uncanny precision. Just like a sniper preparing to pull the trigger, you can prime your shot by gently applying a small amount of pressure to the button. Then, when the moment is right, a small motion allows you to instantaneously trigger the button the minute you need to. Our only complaint about the button layout is that it’s only suitable for right handed players. This is a pretty common theme among gaming mice, however Logitech has no excuse for this one. Ergonomic mice are designed in such a manner that it would be impossible to use with your left hand. But the G Pro is almost perfectly symmetrical. Had they just thrown two thumb buttons on the other side, this mouse could be enjoyed by “lefties” and “righties” alike. If you’re looking at the photo right now, you may have noticed that we left a single button out. Directly below the scroll wheel is the DPI button. A quick tap will allow you to switch between high sensitivity (up to 12,000 DPI) or low sensitivity (as low as 200 DPI.) This is actually an incredibly useful feature while you’re gaming. Most of the time, you’ll want to use a high DPI mouse to give you extreme precision and responsiveness in all situations. However, this is not always ideal. If you’re playing an FPS game, for example, you might not want a super sensitive mouse. You’ll want to reduce the sensitivity to smooth out the motion and offer a more precise aim. In this case, all you have to do is tap the button and the DPI will automatically be reduced. Depending on how you want to set this, you can use the included software to set your range. For example, you can do a small range and jump between 6,000 and 10,000, for example. This customization lets you configure the mouse to your exact needs. 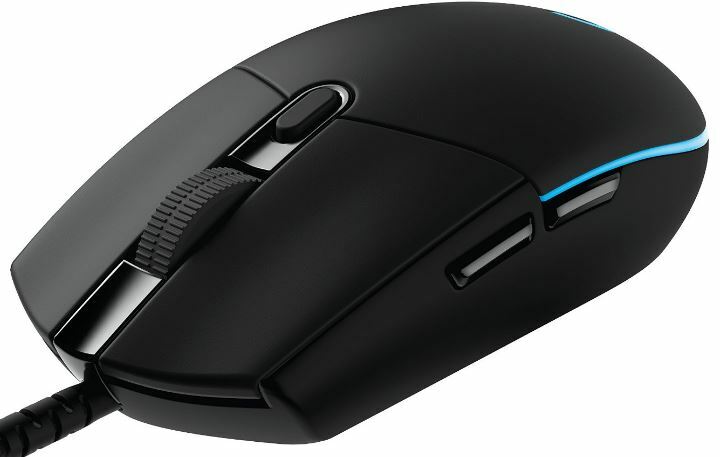 The real power of this mouse comes from the included Logitech Gaming Software. This attractively designed program lets you modify nearly every function of the mouse. You can assign different buttons to different commands, change the sensitivity ranges, and even set your color scheme. Different games require the gamer to use different mouse configurations, so you can actually have multiple configuration files and the game will select them on an application specific basis. The most powerful feature in the gaming software is the tuning function. Not all surfaces respond the same. If you have a wood desk, performance will be different than on a glass desk, for example. This tuning function allows you to automatically select a list of pre-determined choices, or you can tweak every setting individually for your own needs. In our experience, the pre-set options worked just find one every surface that we tried. However, it is nice to have the additional level of control if necessary. All of these features are fine and dandy, but what do they mean for the real world? We had to try it out for ourselves, so we fired up a few different popular games to see how it would perform. The first game we tried was Overwatch. This can be a bit of a twitchy game, so we knew this would really put the mouse to the test. We spend a couple minutes mapping our buttons, and then went off to the races when the game loaded. Expecting to have to go back and tweak the settings, we were surprised to find that we felt right at home with the mouse. Because the software was so intuitive, we were able to select the correct settings that allowed us to enjoy tighter aim and improved responsiveness to the games environment. 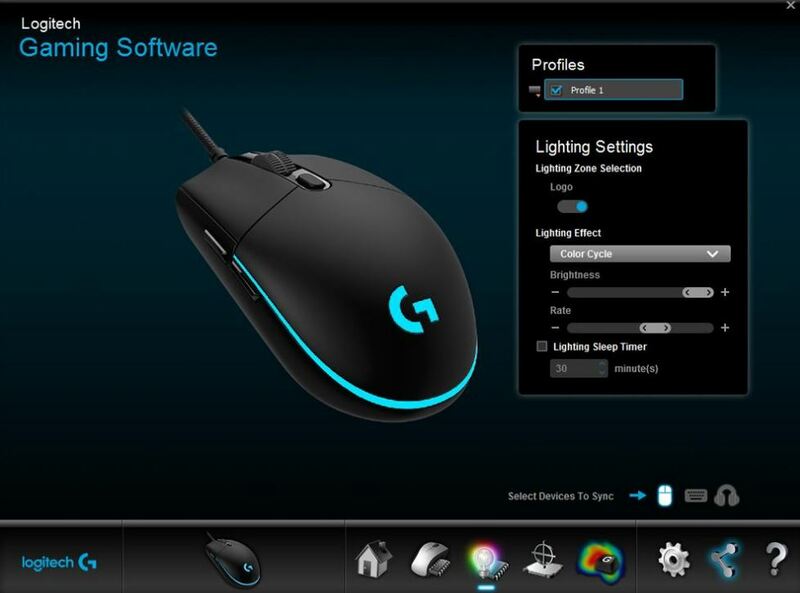 So, Should I Buy The Logitech G Pro Gaming FPS Mouse? This mouse is all about balance. Sure, there are a couple of additional features available in their $150 G900, but these are only for very specific usage scenarios. 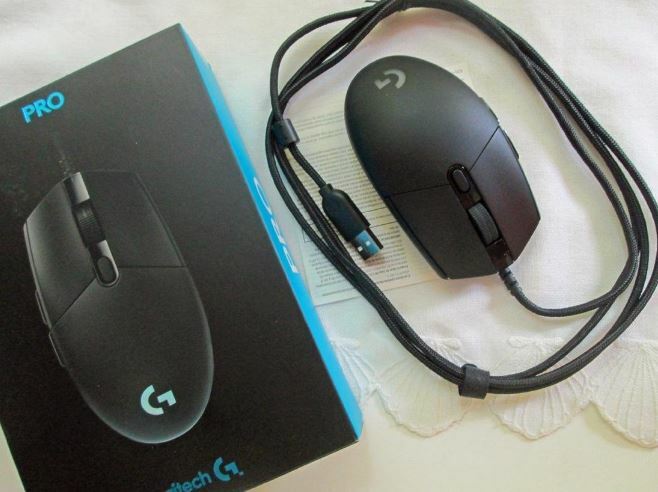 The G Pro has everything a competitive gamer would need for most games, and shaving off a couple unnecessary features like adjustable weight and a dedicated sniper button allow them to sell this mouse for half the price of their other gaming mice. We found that even the complicated features were made accessible to casual gamers through their easy to use software. The learning curve was literally seconds, and we could start playing games almost as soon as we had plugged the mouse in. There were definitely some noticeable improvements from last year’s model. If you already own the G303, these features might not be a big enough improvement to warrant an upgrade. However, if you’re on the market for a new gaming mouse the G Pro is one of the best deals we could find.